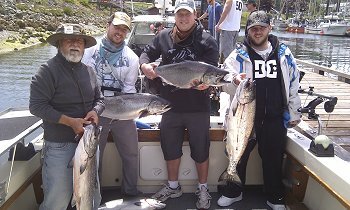 13th July, 2011: FISHING REPORT: Port Alberni Inlet, Barkley Sound, Ucluelet (West Coast), Somas-Stamp River System. There has been some phenomenal fishing on Vancouver Islands West Coast and also in the Port Alberni Inlet and many areas of the protected waters of Barkley Sound. The West Coast has had very consistent salmon fishing with some great Chinook fishing in the many inshore and offshore locations. Barkley Sound has had vast quantities of bait fish which have brought the many migratory Chinook into surfline and inshore areas as far as Pill Point. 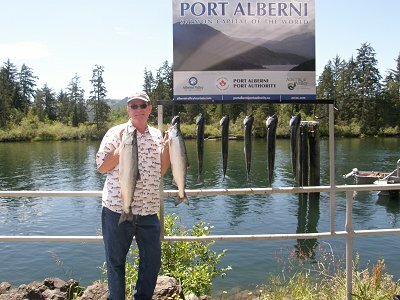 The Port Alberni Inlet has filled with Sockeye salmon which has pleased the hundreds of sport fishermen fishing the pristine and very quiet waters of the Alberni Inlet. We are expecting the West Coast and Barkley Sound regions to have some excellent Chinook and Coho fishing right through August. Pink Salmon should also be in fantastic numbers also by the middle of this month. Everyone fishing the outside and inner areas of Vancouver Island will have a great opportunity to land a pacific salmon this summer. The Sockeye run in the Port Alberni Inlet has been bumped from 600,000 Sockeye to 1.4 million. The Sockeye Salmon fishing has been fantastic but there has been a slowing effect for the sport fishermen over the last few days. The winter had huge snowfall amounts on the nearby Vancouver Island mountain ranges and with a very cool spring the huge snow packs have been slow in melting. The Sockeye began to arrive in May and moved into the two major nearby lakes which are Sproat and Great Central Lake. The Sockeye usually begin to school in the Inlet but because the Somass River and Port Alberni Inlet water has remained cool the Sockeye have moved quickly into the Somass system. Currently there are well over 560,000 Sockeye swimming the waters of the two lakes where they will sit in deep water until the fall when the streams and creeks fill with water where the Sockeye will spawn. The Department of Fisheries and Oceans is concerned about the numbers of returning Sockeye and that the lakes will be to full of these most delicate of the all salmon species for good survival rates. To slow the continued movement of Sockeye moving into the lakes the DFO has opened a Seine and Gill Net commercial fishery for one full week. The Seines can pickup fish in any area from the surface to 80 to 100 feet down and the gill nets are picking up all those Sockeye in the top 30 feet of water headed to the river. The commercial fishery has hammered the sport fleet. Sport boats that were limiting on Sockeye are now fortunate to land two or three Sockeye per morning. We are hoping the commercial fleet moves rather quickly and gets their allocated numbers. New salmon should move in and hopefully for the sake of the Port Alberni Community the sockeye fishing for all sport fishermen can once again improve to what it was in the last two weeks of June and the first week of July. The fish that are hitting the sport lines are still hitting a variety of pink colors mixed in with blue and black. Leader lengths should be from 22 to 27 inches in length with green, red, purple haze or other colored hotspot flashers. Dummy flashers are also important as the Sockeye are attracted to the boat by color. The expectation of some good fishing in the last two weeks of July and first fifteen days of August is still predicted. Check with Doug of Slivers Charters Salmon Sport fishing. Barkley Sound salmon fishing has been very good and quite consistent for the last several weeks. 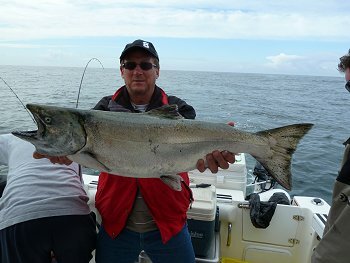 Surfline areas have had good Chinook fishing and now some nice sized Coho are beginning to show. Inland water fishing points such as Pill Point, Alan Point, Vernon Bay and Swale Rock which has really been on fire, have had some fairly decent fishing with mostly Chinook coming in to feed on the rich resources of bait fish in these predominant fishing locations. The Surfline locations especially Meares, Austin, Cree, and Edward King have been good for both Chinook and now Coho. The Chinook have been mostly in deep water ranging from 70 to 120 feet. Swale Rock has had salmon on either side of the Rock on the Imperial Eagle side out in deeper water or on the channel side and also over towards Mara Rock. Anchovy behind a variety of hotspot flashers really seems to be the best method to fly on the troll. Rhys Davis Teaser heads in purple haze, green, clear and bloody nose are working well especially for Chinook. The green nickel, silver glow and watermelon are three great coyote spoons and in plastic the green spatterback and the AORL12 and T-Rex are doing well landing some Chinook but mostly for the Coho. The mid summer run of salmon in both Chinook and Coho are now just beginning. These salmon are migratory fish headed to watersheds to the south. The predominant age class of this run of fish which is one of the biggest runs predicted over the last fifteen years are four and five year olds which means there will be some Chinook salmon in the high twenties to mid thirty pound range. Barkley Sound has some great locations that are protected from southerly or northerly winds which makes it a great area for salmon fishing. 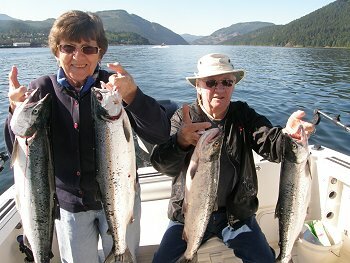 Ucluelet has had some of the best fishing on Vancouver Islands West Coast since early May. The consistency of many excellent salmon fishing days is difficult to beat anywhere in British Columbia. The inshore and offshore fishing for Chinook and Coho have been excellent and the halibut fishing has also been good in most locations. Recently the inner and outer southbank as well as the long beach bank and the lighthouse bank have been good. The Wreck and the Big Bank have been consistent but the fish have been a little smaller further out. The bait seems to be changing. There is still a lot of needle fish but bigger pilchards are beginning to show up. Coyote spoons in the three and a half and four inch size behind a variety of flasher colors espcecially glows are working but with the Pilchards showing up many guides and sport fishermen are no longer using flashers but are trolling with big six and seven inch spoons and plugs. If using a flasher with the larger spoons keep the leader up to seven feet and use a blue or purple mirror. There are plenty of salmon out on the various banks offshore of Vancouver Island in which many are close to the bottom or in the midwater.. The halibut hide in the sand on these various banks and many fisher persons and guides are still bringing their lower lines close the the bottom and are picking up halibut on the troll. If this method is not working go to halibut jigs or a spreader bar. The Chinook and Coho numbers are increasing daily on the coast and with this being an odd year look for millions of pink salmon destined for the Fraser River. July and August will be excellent fishing months out on the west coast. Ucluelet has a mothly ladder derby. Each month the three biggest salmon are awarded cash prizes with all of the top fish entries from each month from May to early September in a fish off for a grand prize during the second weekend of September. The yearly cost for the salmon ladder derby is $50 and daily it is $10 and can be picked up while in Ucluelet. Ask your guides or get in for at the information center.